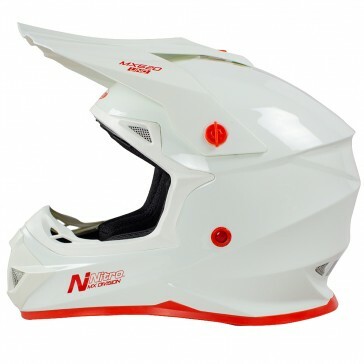 The MX620 Junior (Youth) range benefits from a reinforced chinbar with an integrated dust filter minimising ingress during race conditions, while the fully adjustable peak with aluminium mounts helps with vision in direct sunlight. Aiding rider comfort further, the MX620 collection also features Nitro’s extensive ventilation technology, combining twin brow air intakes with a dual 3-piece construction rear exhaust and central top exhaust ventilation system. All MX620 helmets feature the easy-to-use DD strap system for safety, with the brand’s anatomic luxury fitted cheekpads. Please note, all helmets which include a visor come with a clear, legal visor as standard. Dark visors are not included unless it is stated in the description. Dark Visors are NOT LEGAL for road use.